The Job Hunter's Encyclopedia is the most comprehensive job and career resource directory on the Internet! Finding a job…a good job…is easier than you think! Yes, the job market is the worst in decades. Unemployment is sky-high and even those lucky enough to have a job are nervous about losing it. If you are concerned about getting or keeping a job, or know someone that is concerned, you can do something about it! • Proven methods and strategies to help you land a great job! I am self-employed and I love what I do and I hope that everyone finds a way to earn a living doing what they enjoy doing. 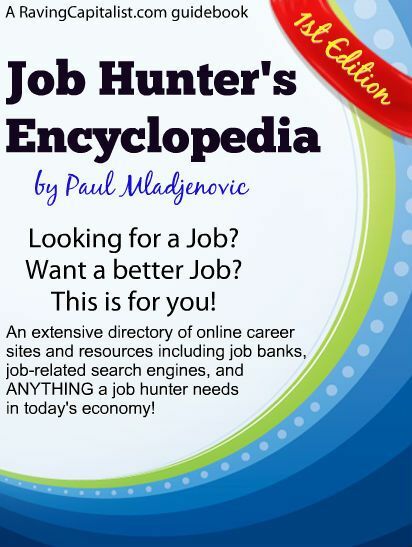 The Job Hunter’s Encyclopedia will help you more than any other employment resource out there. For less than the cost of a decent meal, you can have hundreds of job-getting resources. Get full master resale rights! That’s right…once you get it you will have the ability to resell this valuable ebook and keep 100% of the profit! Or you can give free copies to your family and friends. You will even get a free webpage (similar to this) for your use (Just remember that you can’t change or edit it). If you only make 1 sale you have your cost back plus a profit!